I finished the treadle quilting Star quilt that I am calling “table scraps”. I am working on some hand quilted background fill on my blue rose quilt. 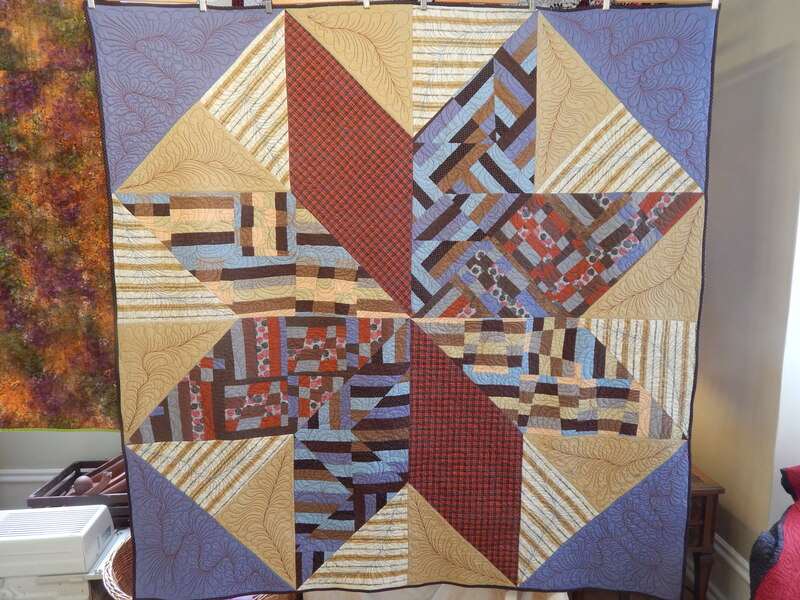 And I put together video of the Treadle machine quilting on the star quilt. 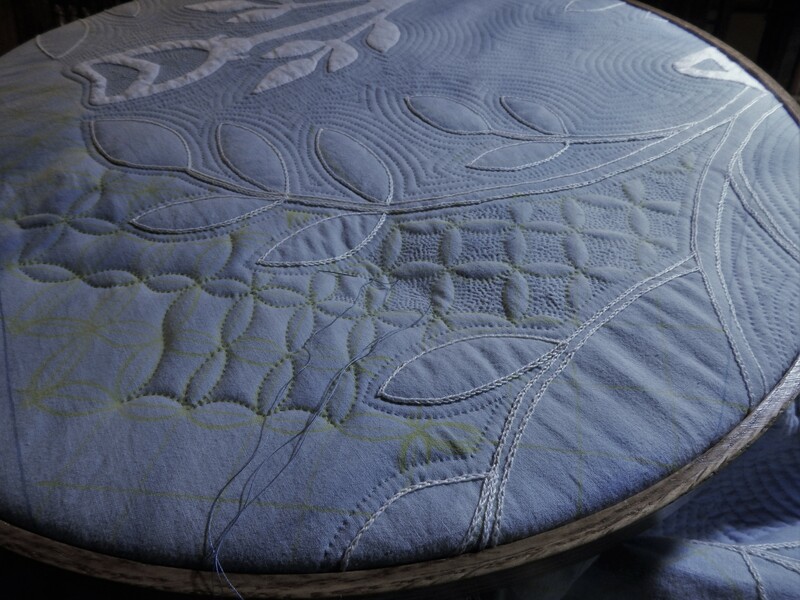 This entry was posted in Quilts and tagged Free motion treadle quiling video, hand quilting, Quilts, treadel quilting. Hooray for another finish. Your Table Scraps quilt is a lot of fun! Your background fill on the rose quilt is spectacular and gives it such great definition. I love your posts so much, but I have a question. Do you ever sleep? You get more done in a day then I do in a month. You are amazing. I really like that star quilt, it’s so eclectic! And I’ve been enjoying your garden, when you take us on a pictorial tour! Do you ever take your hand quilting out into the garden, maybe in a shady spot, to work close to all the beauty out there? Wonderful quilt, Tim! I sure like the effect of the various piecing styles and that striped fabric in the setting triangles was the perfect choice! You’re obviously having a great time machine quilting and the complexity you’re developing is showing up in your hand quilting too. Great quilt, Tim! 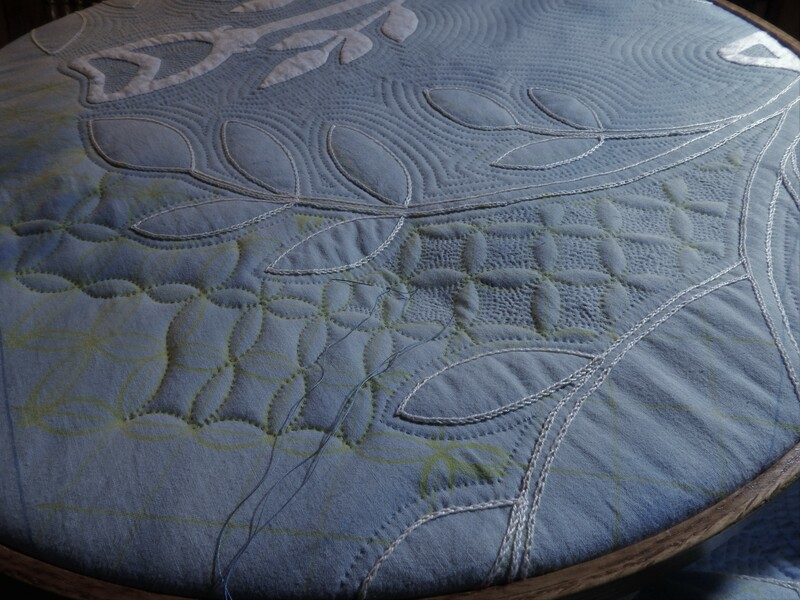 The treadle quilting is amazing….I have a question….I have a treadle machine (it’s a Franklin model)….At this point I don’t know if it works….once that determination is made, if I need any parts, where do you find parts for the treadle machines you have? This treadle machine belonged to my husband’s great aunt and I would really like to get it going…I have said for years that I wanted to make at least one thing on it….but after following along on all your quilting, now I want to get it going even more, and would use for machine quilting I think. Thanks for all the inspiration….and for your videos…they are great! Hello to Teddy! Happy 4th of July to both of you!! Most often they are built like tanks and don’t need new parts, just a cleaning and oiling to get back to working condition, Some have had missing parts and I was able to find what I need on eBay. Your Table Scraps Quilt is great. Love the story and seeing how it all went together….. well done!! How do you retro fit a class 15 machine to be a treadle?? And where do you find a hopping foot for these machines?? I see that you say eBay is a place you get parts….but is there any particular way you search for these items?? Thanks in advance. ‘Absolutely love following your work!! And a bonus is seeing all your flowers and plants the old home area of MI has….makes me homesick. You are greatly appreciated with your kind sharing and teaching!! just about any machine that is belt driven will fit into a treadle base with no modification at all, just take off the motor belt and put on the treadle belt…the hopping foot is standard ….for a model 15 singer just search for “low shank free motion quilting foot” the same foot fits most of the singers…..a few exceptions like the 301-600’s which are slant shank machines and take different feet.